Amine Harit is a 20-year-old midfielder who currently plays for German side Schalke. The Moroccan is relatively unknown, but he will be eager to make a name for himself at the upcoming World Cup. 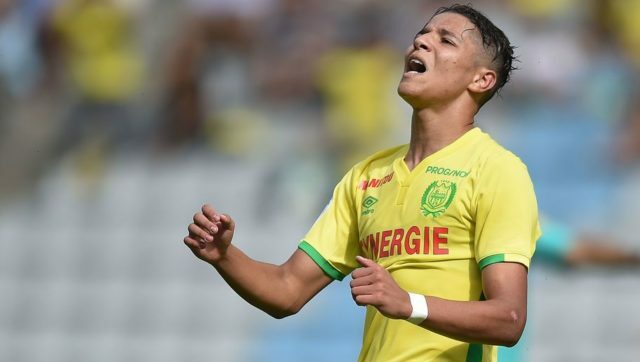 Despite being born in France and winning the European U-19 championship with France, Harit has changed his allegiance to Morocco. Harit started his career with French side Nantes before signing for Schalke in the summer of 2017. He was a regular player last season, playing 32 games in all competitions as he helped Schalke finish 2nd in Bundesliga – though they were 21 points behind winners Bayern Munich. Morocco have managed to qualify for their first World Cup in 20 years, and they have been put in a group consisting of powerhouses Portugal and Spain as well as fellow underdogs, Iran. Herve Renard’s side topped their qualifying group with 12 points – four more than second placed Ivory Coast. Heads have now been turned towards Morocco as they look to make a name for themselves on an international level. However, Harit will also be looking to make a name for himself at the World Cup. The midfielder has been described as a fantastic dribbler. His fancy footwork often sees him breeze past opponents with ease. Amine Harit was part of the Moroccan side which secured their place in Russia. He made his debut against Gabon and was impressive in qualifying as Morocco qualified for the World Cup. Harit’s footwork made him a nightmare for defenders to dealing with which has resulted in penalties as defenders look helpless to stop him. Defenders often just take him to the ground as they’re unable to get the ball off the 20-year-old. The skilful midfielder was able to drive forward Morocco and his club Schalke time and time again last season, and his range of passing abilities allowed him to help change games within a blink of an eye. Despite liking to have the ball at his feet, the French-born playmaker always looks to make the killer pass instead of going for glory himself. While finishing is something the 20-year-old needs to improve, he has demonstrated that he’s capable of scoring, with goals coming against Stuggart, Boroussia Dortmund and FC Koln last season. While primarily playing as an attacking midfielder last season, he was also played out wide at right-wing on six occasions where he made two assists and netted on two occasions proving that he is versatile. Harit was awarded the ‘Bundesliga Rookie of the Season award’ after a promising campaign with Schalke last term proving why he is one to look out for. By no means is Harit the finished article, but at just 20 years of age, he has been tipped as a player to look out for at the World Cup. With Morocco having been given a very tough group, Harit will be key for Herve Renard and co. as they look to assert themselves as one of Africa’s biggest national team sides. In recent years, Africa has most notably seen Ghana bring pride to the continent with the Ghanaian’s reaching the quarter-finals of the World Cup in 2010. If Morocco have the same aspirations, it is without doubt that Harit will be looked at as a vital part of the Moroccan side as he and Morocco look to make a name for themselves. Harit’s compliation of the 2017/18 season. It’s not just in real life that Harit has been thought of as a promising youngster. Harit has become a popular player for many Football Manager players – who view the youngster as a profitable player on the game. The midfielder has bags of potential on the game, and he is valued at €13.75m at the start of the game.